A resilient Japanese space probe is on track to become the first spacecraft to return to Earth with pieces of an asteroid when it drops a sample canister in a deserted patch of the Australian outback in June. Japan's plucky Hayabusaprobe is slowly limping its way back to Earth despite several glitchessince its 2005 rendezvous with the small potato-shaped asteroid Itokawa. Itwill drop a capsule containing the sample canister down on the WoomeraProhibited Area in the South Australian outback as part of an agreement betweenAustralian authorities and the Japan Aerospace Exploration Agency (JAXA). The Woomera Prohibited Area, which is managed by Australia'sDepartment of Defense, is the largest land-based test range in the world. "Australia is proud to support Japan in thisworld-first expedition," said Senator Kim Carr, Australia's Minister forInnovation, Industry, Science and Research. Hayabusa spent three months exploring the Itokawa asteroid inlate 2005, even making an unplanned landing on the asteroid's surface. 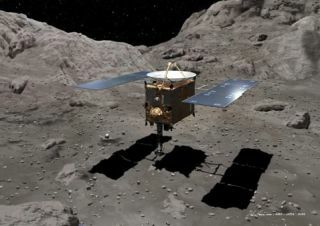 Theprobe spent up to a half-hour on Itokawa, making it the first spacecraft to liftoff from an asteroid. While telemetry showed that Hayabusa likely did not fire itsprojectile as planned while on Itokawa's surface, scientists are hoping thatbits of dust or pebbles traveled through the probe's funnel and into its samplereturn capsule. Hayabusa took approximately 1,600 pictures, collected about120,000 observations of near-infrared spectral data and recorded 15,000 datapoints with its X-ray spectrometer to investigate Itokawa's surfacecomposition. The 950-pound Hayabusa launched in 2003, but encountered a seriesof difficulties over the course of its troubled asteroid mission. Thosesetbacks included ion engine troubles, a fuel leak (during which groundcontrollers temporarily lost communication with the spacecraft), and loss ofpower in an electrical battery. Each of the probe's four ion engines has experiencedglitches, and in November 2009 JAXA officials were doubtful Hayabusa would everbe able to returnto Earth. But since then, Japanese engineers devised a plan that combinedparts from two partially-failed engines to help Hayabusa maintain its currentscheduled return. These revised plans called for the beleaguered Hayabusa tocontinue thrusting its engines until March, after which its ion system wouldshut down and the probe would coast toward Earth. Hayabusa is then expected tojettison the onboard sample capsule so it can re-enter Earth's atmosphere andmake a parachute landing in Australia. Hayabusa's return to Earth was already postponed from itsoriginal 2007 timeline after the probe's departure from Itokawa was delayed ayear due to the spacecraft's mechanical problems. Japan's partnership with Australia for Hayabusa's return toEarth is an example of Australia's ongoing contribution to international spaceprograms, Carr said. "Australian authorities will assist JAXA in ensuringthe recovery of the spacecraft on its return and are working closely with theirJapanese counterparts on the proposed path and landing of Hayabusa," saidJohn Faulkner, Australian Minister for Defense. "This has been an historicmission. It is the first time a spacecraft has made contact with an asteroidand returned to Earth."